It was like the first time I saw Matt Freeman play live, felt the throaty bass line of a punk song I loved while getting battered by a room full of anxious Japanese punk rockers. We'd all turned our studded belts inside out to get through security, but the sharper ends were out again and jostling into my sides. Limbs flailed to the music, bodies knocked against each other, we pressed, pushed, and shoved. This was no American mosh pit - in which my chances of survival would have been reduced to zero certain death - but my arms would be sore for days afterwards. My eyeliner dissolved in the sweaty, sticky heat, and the goosebumps kept coming in waves that tasted like metallic ecstasy. The goosebumps here were warmer, though, more seductive, loud only if heard from inside your own head, like the humming heat that swirls around your lips and the back of your neck the first time you kiss someone you really like. 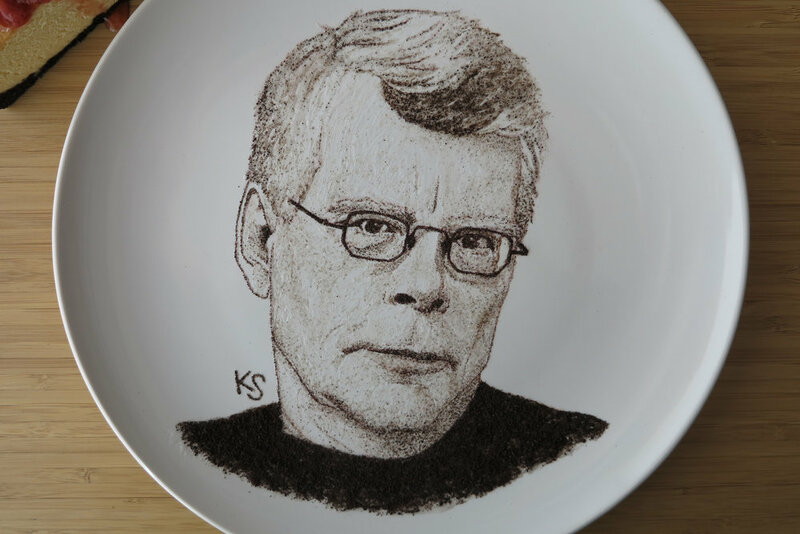 The only noises audible were the creak of a chain, an occasional shout, and the thrum of velvet tires on wood so smooth and so steeply banked that my stomach turned into knots looking down at it. 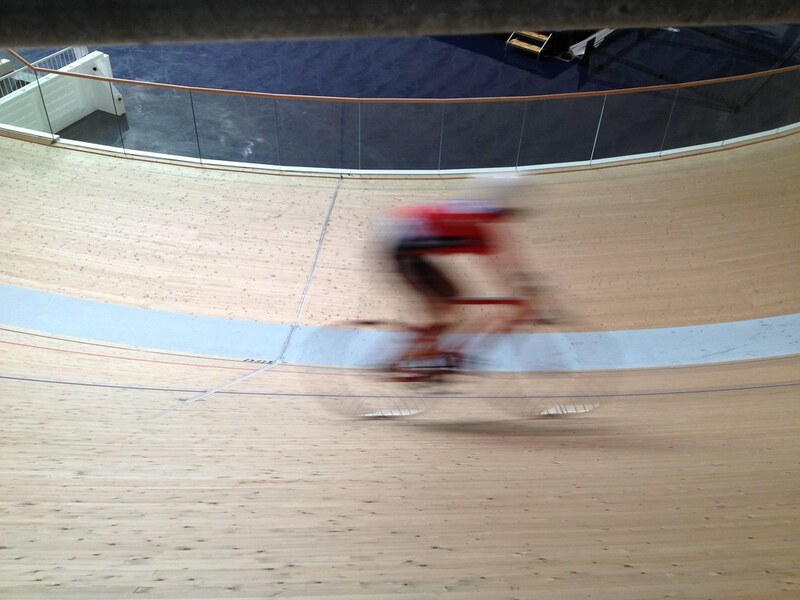 A few hundred feet from a race that had destroyed me, I found serenity at the Izu Velodrome. 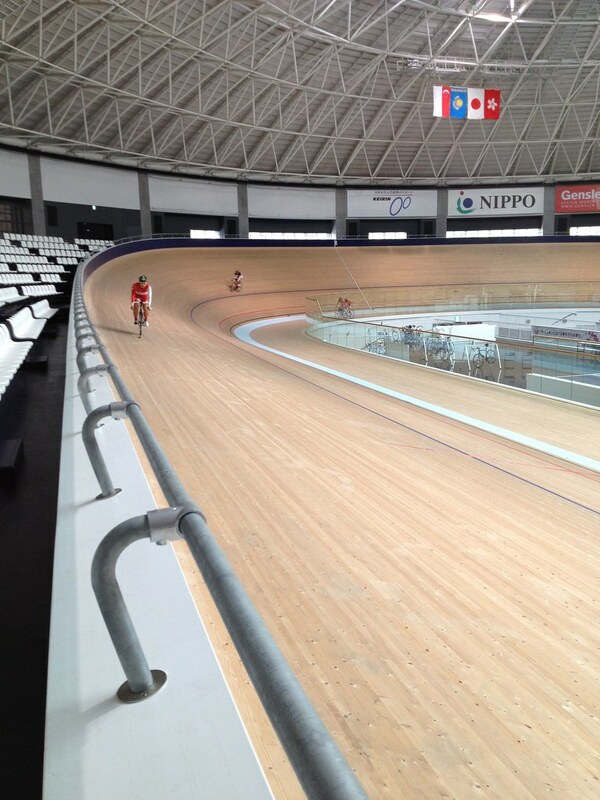 Opened in October 2011, the Izu Velodrome is Japan's first, indoor, wooden 250m track, complete with 45 degree banks. 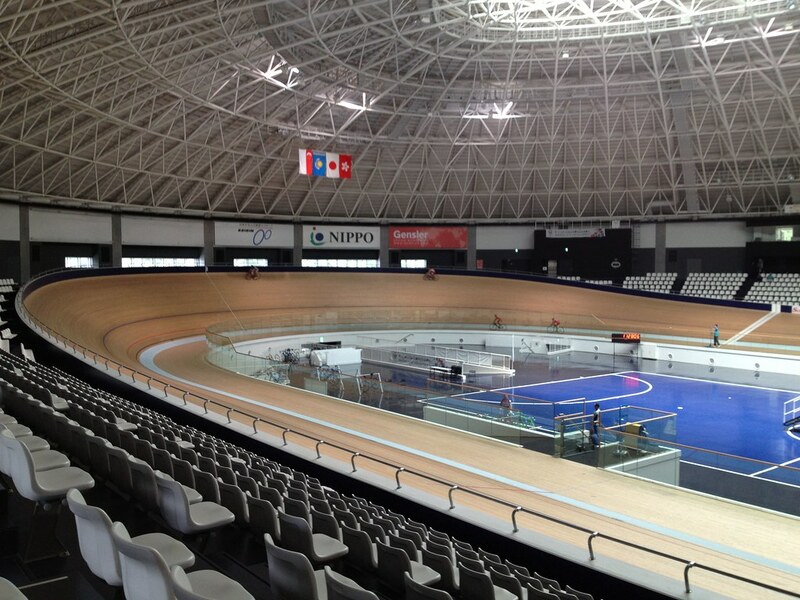 Built by Gensler to serve the dual purpose of allowing Japanese track cyclists to train at home and to give Japan the ability to host UCI Category 1 track races, it is also used by the Continental Cycling Center as a training facility for promising track cyclists. On Sunday, two Hong Kong national track cyclists, Singaporean Wai Mun, and a Japanese female pro keirin cyclist were circling the track. They slipped around each other, trading places with an easy grace that understated how fast they were actually going. Responding to unintelligible shouting from a coach, they took turns sprinting around the banks, riding so close to the railing that I snatched my hands back more than once, catching my breath as they rushed by. I remembered the first time I rode on a track [at Kissena], the slightly banked corners nearly shoving me down towards the sprinter's line, gravity simultaneously pulling me to earth. The speed took me by surprise, my stomach flopped and fluttered, before the muscles in my legs forced my attention elsewhere. 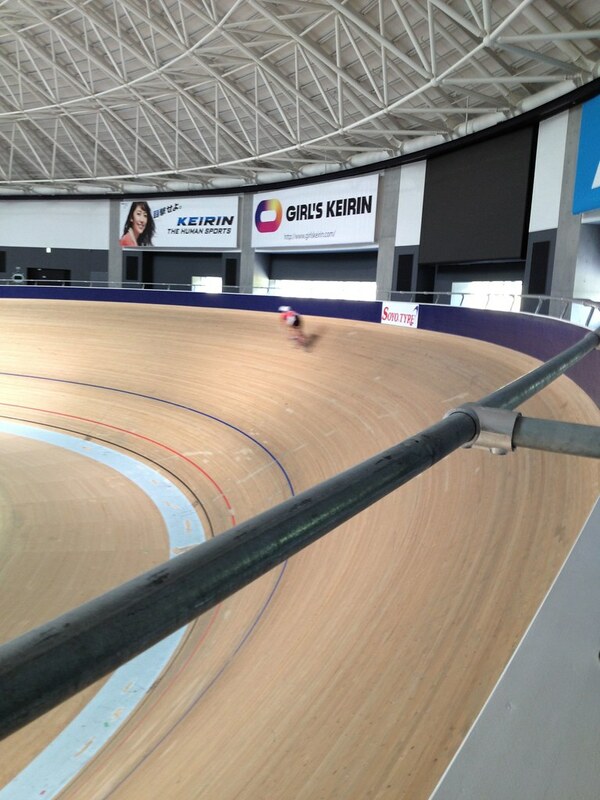 Launching down the corners of the Izu Velodrome must feel like freefalling in comparison. My heart pulsed at my throat as I watched the pros riding perpendicular to the slick surface, my hands sweating for them. People dismiss eternal laps of the track as terribly boring. There's nothing to see, they say, nowhere to go. There is truth in that. 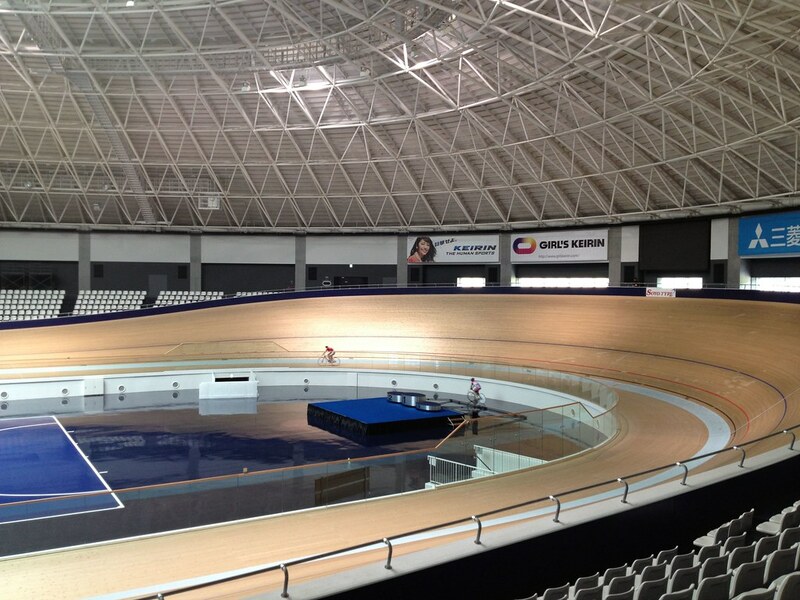 I dare you, though, to stand next to a velodrome and not marvel at the simple beauty of it. To not be tempted to try spinning down steep, slippery banks made to shave seconds off sprints. With feet clipped into a bike with a single, fixed gear. No brakes, no wind. Just you and your gut-wrenching goosebumps.